Since I’m still battling the aphids (after trying soap and water and then the sadly outdated pyethrum spray from my shed, I’ve been reduced to rinsing off individual plants under running water, and even that has failed to eliminate the problem) and now these critters showed up today, I’m beginning to feel a mite cursed. All the seedlings that were inside this morning (cardoons, tomatoes, peppers, dahlias, mizuna, etc. etc.) are now outside enjoying the sunshine, beginning the hardening off process a little early, and hopefully encouraging the invading insects to scatter (I’m also hoping for some ladybugs to eat the aphids). Most of the pitiful brassicas have been planted in two different gardens and are sitting under row cover that is hopefully not serving as convenient protection for any leftover aphids (I tried to knock them all off, really I did). I would say “worst year for seedlings ever” but actually most of the remaining plants look pretty good; what doesn’t kill you makes you stronger, I guess. And now I need to start some more summer seedlings to go out in a few weeks – after I make sure there are NO grasshoppers left in my laundry room. ← What ails our root vegetables? Oh my! I've never heard anyone say that they had bug issues on their inside seedlings. I hope you're able to get rid of them. Thanks – and yeah, I can deal with the occasional fungus gnat, but this is ridiculous. Oh my, I wish I could help you. I've only had those annoying gnats around my seedlings! I wish you luck! Thanks! 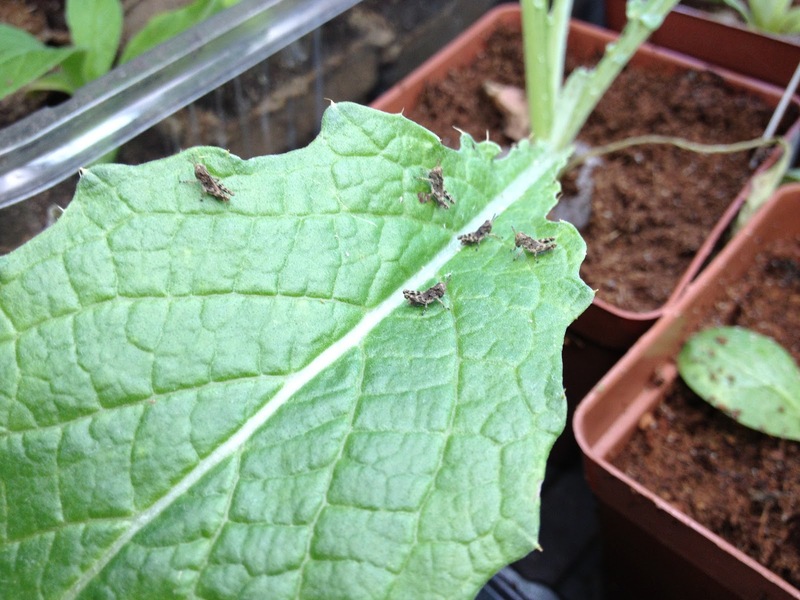 Putting the plants outside did make the grasshoppers go away, if not the aphids yet. This includes a suggestion that you use silver mulch, wh they don't really like beneath them — it's like being blinded on a beach without shades. Looking at comparative closeups, I don't actually think these are leafhoppers – they've got the distinctive large hind legs of grasshoppers, and no long wings, and the heads look grasshoppery too. Whatever they are, they scattered when I took the plants outside, and I think I've squished all those left inside. I'm assuming they came in in egg form with some pots or trays I didn't wash right away. Mary Kay says definitely grasshoppers- either adults of a small species or immatures of a larger species. Thank you Jon and Mary Kay!